West Windsor, N.J. – Forty-four MCCC alumni who have earned their bachelor’s degrees through the William Paterson University (WPU) at Mercer program during the 2012-13 academic year were the stars of a graduation reception May 3. The event, hosted by WPU at the Mercer County Community College (MCCC) Conference Center, celebrated students' hard work and perseverance and the start of the next phase of their lives. Since the WPU at Mercer program began in 2009, 79 MCCC graduates have continued their studies at WPU on the West Windsor campus in degree programs including Management, Early Childhood Education/Elementary Education, Liberal Studies, and Psychology. Currently, 180 students are enrolled. Also participating in the ceremony were WPU President Kathleen Waldron, Ph.D., and Provost and Senior Vice President for Academic Affairs Edward Weil, Ph.D. WPU deans from the Colleges of Business, Education, and Humanities and Social Science also spoke, as well as MCCC Dean of Liberal Arts Robin Schore, Ph.D.
WPU at Mercer graduates are also invited to participate in William Paterson's regular spring commencement, to be held May 15 at the IZOD Center in East Rutherford. Two graduates who attended the ceremony, Education majors Eric Stewart of Bordentown and Dana Skillman of Hamilton, are already feeling the value of their undergraduate degrees. Both landed jobs in their field following graduation in December. Stewart says that WPU was another move that was best financially. “Plus I had familiarity with the MCCC campus. I was moving on with many of my peers,” he observed. He notes that WPU’s discounted tuition rates for MCCC students made the remaining cost of his undergraduate education reasonable, enabling him to focus 100 percent on learning and on extracurricular activities like the Future Teachers Club, where he served as vice president. He was a member of Kappa Delta Pi, the international education honor society, and Pi Lambda Theta, a WPU organization for future teachers. At WPU at Mercer, Stewart took 16 courses on campus and 16 courses online. He notes that those who major in Education are also required to have a second major. Stewart chose Liberal Studies, selecting concentrations in English and History. “It worked out and I enjoyed it all,” he said. Graduating from MCCC in 2010, Skillman transferred seamlessly to WPU alongside Stewart and other associate degree grads from Mercer’s Education program, earning dual certifications in Early Childhood/Elementary Education in December, with a second major in Psychology. She says she was well prepared for her current job as a lead teacher at the Goddard School, a pre-school with several locations in Central New Jersey. Dana Skillman and Eric Stewart are pictured at the graduation reception. Both are December graduates who majored in Education and have found jobs in the teaching field. 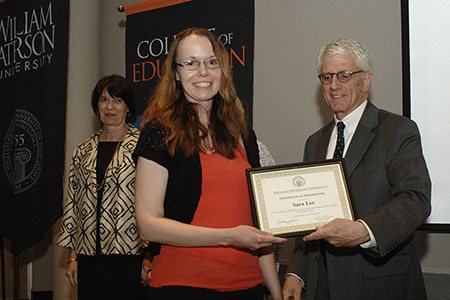 Sara Lee earned WPU's Academic Excellence Award. Lee earned her bachelor's degree in Psychology and plans to pursue her master's in the field. 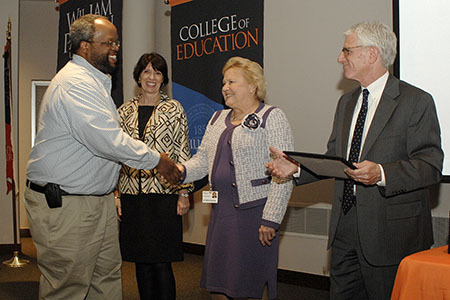 Chris Obudho shakes hands with MCCC President Patricia C. Donohue. Also pictured are WPU President Kathleen Waldron and Provost/Senior Vice President for Academic Affairs Edward Weil. 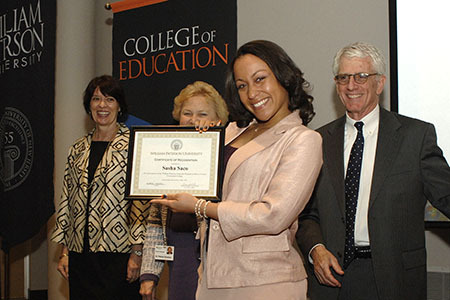 While at Mercer, Obudho, a 2011 graduate, was selected to the Phi Theta Kappa Honor Society's All-State Academic Team. Sasha Saco is a happy WPU grad. 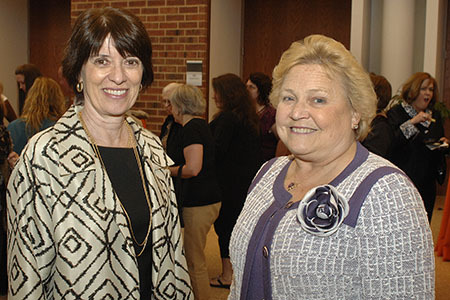 WPU President Kathleen Waldron, left, and MCCC President Patricia C. Donohue. Now she is experiencing that same kind of camaraderie at Goddard where, as lead teacher for the 6- to 18-month class, Skillman says that a team approach makes a good program great. “We all work together,” she said. 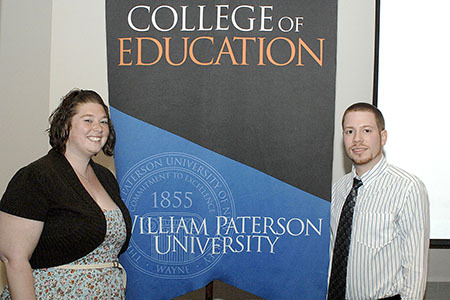 William Paterson University has rewarded excellence for MCCC graduates who transfer to WPU at Mercer. The university has awarded more than $150,000 in scholarships to 30 MCCC graduates who are members of Phi Theta Kappa, the international honor society for two-year schools, and other students with high grade point averages. Another seven will receive scholarships in May for the 2013-14 academic year. More information about WPU at Mercer and other bachelor degree programs on the MCCC campus is available here.